You are using an outdated browser that will cause usability and security issues. Coaches, it's important to continue learning, growing and honing your skill set, too. 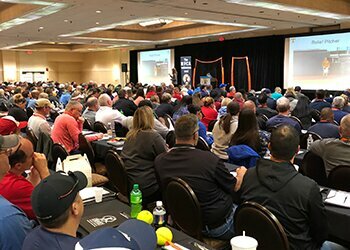 Attend an NFCA Coaches Clinic and surround yourself with hundreds of other passionate coaches. We promise you'll leave with more knowledge, more drills, better philosophies and maybe even some free equipment! Our speakers will reignite the fire within you to be a better coach for your student-athletes. These two-day events will provide you with an "up close and personal" setting to learn from world-class speakers. Topics range from pitching and offense, to base running, team culture and practice planning. Have a question? You can ask it during the Q&A panel with the speakers, in the hallway post-speaker sessions or find our speakers at the social hour. Sign up early for best pricing! 2019-20 Speaking Lineups Coming Soon! Also, by providing the group name or the group code “B19” attendees will also be able to make reservations by calling the hotel. * Please make hotel reservations by December 26, 2018. 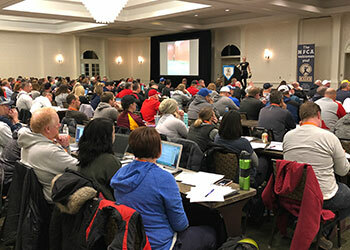 The NFCA Coaches Clinics are the perfect opportunity to get your product or service in front of hundreds of grassroots coaches across the country. Our speaker schedules have built-in breaks for exhibit-only time, as well as an evening social hour. Attendance varies anywhere from 250-450 coaches at each location. Booth placement will be: NFCA Official Sponsors and Partners, NFCA Loyalty Rankings, first-come, first served time-stamped applications. Please note: These are table-top set-ups, NOT 10’x10’ booth spaces. *A discount of 10% will be given to companies who register for three or more clinics (when registering with the same email address). Electricity, internet and power needs vary from hotel to hotel. Once registered, companies will receive site-specific information regarding additional service needs prior to the clinic. Each exhibitor is responsible for any additional fees associated with hotel services. Please do not ask our speakers to endorse any of your products/services. This puts them in a very difficult position. Videography is ONLY permitted inside of your booth/table with the consent of those being interviewed. Videography of any other vendors OR the clinic OR the speakers themselves is not permitted. Interested in advertising to our attendees at every clinic? Click here for more information. Please contact our Marketing and Sponsorships Specialist, Emily Allard, if you have any additional questions: emily@nfca.org. 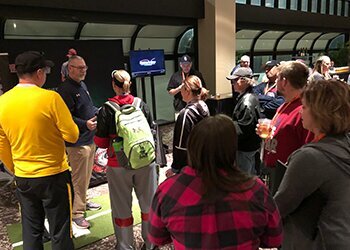 Want to have your camp promoted by the NFCA? Contact Events@nfca.org today! Subscribe to receive correspondence about all NFCA Events!